Duke Bound senior Jenna Crean of Orchard Park appears to be rounding into form, just in time for the championship February and March seasons. Crean took on Tapestry 7th grader Jada Kenner in both the 55 and 300 meter races this past Saturday, edging her out in both races. In the 55 meters Crean's 7.32 was just enough to edge out Kenner who finished 2nd in 7.33, just ahead of Crean's Orchard Park teammate Leah Pasqualetti who ran 7.39. Both Crean and Kenner came back later in the day in the 300, where Crean again held off the 7th grader 41.38 to 41.55. Kenner's teammate Nia Stevens finished 3rd in 42.53. All those athletes came back for the 4x200 relay later in the day, and probably the most exciting race of the day as 3 teams finished under 1:47.50. Orchard Park, led by Crean and Pasqualetti won in 1:47.17, Tapestry led by Stevens and Kenner was 2nd in 1:47.39, with perennial power Lancaster finishing 3rd in 1:47.41. This is shaping up as one of the races to watch as we head towards sectionals. Another section 6 youngster who appears to be taking it to the next level is Sweet Home 8th grader Amari Hall. Amari won the triple jump, in a personal best, 36'11, currently the best jump in the country by an 8th grader. The mark is 4.5 inches behind her sister, Lanee Hall, for the WNY lead. 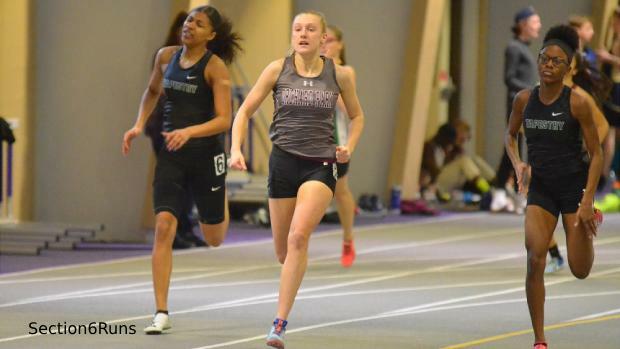 In the distance events East Aurora/ Holland freshman Megan McLaughlin took on a loaded field to win the 1000 meters, catching Amherst junior Maxana Grubb over the last 100 meters, and just outdistancing herself from Lockport super sophomore Sydney Nowicki. Nowicki came back later in the day to grab the win in the 1500 meters over Amherst freshman Mallory Grubb. In the vault current WNY leader Rachael Ward of Falconer overcame a challenge from Orchard Park junior Leah Psaqualetti, who vaulted a personal best 12'0. In the shot put East Aurora/Holland junior Serena Pagano had a big PR of 36'8" to take the event over Maryam Akaic of Tapestry. On the boys side of things Frontier's distance runners look strong with sophomore Joshua Peron winning the 600 meters, in a personal best 1:23.93, junior Connor O'Brien won the 1000 meters in a personal best 2:40.11, and junior Brian Gleason was 2nd in the 1600 meters in 4:32.10. Grey Conover of Clarence looks like he is rounding into post-season form as he won the 3200 meters in a season best 9:57.79, and Lancaster senior Elijah Kerner won the 300 meters in a season best 36.74. Both are former state qualifiers in those events, and look to be prepared for another run at states this year! Chris Kaszynski of Kenmore West looks prepared to challenge for the section title as he extended his section lead in the pole vault winning in a personal best 13'7". Meanwhile Cheektowaga senior Jake Kaminski, who has been fairly dominant all year in the jumping events, won the triple jump in a personal best 43'5". Over at the Rock and Roll throw off Lancaster sophomore Natalia Surdej had a big day taking both the shot put and weight throw, with a PR in the shot of 38'1, and just missing her PR in the weight with a big throw of 55'3'. On the boys side brother John Surdej had a big throw to set a PR of 59'11.5, in winning the shot put. However the competition of the day might have been the boys weight throw, as it served to be a preview of the NYS Champs next month! Averill Park's James Cocca travelled to Lancaster to capture the weight throw in 65'3.5. He was followed by Lancaster's Andy Pietrantoni who was 2nd with a toss of 64'8.5, and state leader William Gross of St. Joseph's Collegiate was third in 64'6.5'. They paced ten throwers with heaves over 50 feet! This upcoming weekend the WNY freshman/sophomore championships are Friday night at Houghton, with some teams running a varsity select meet on Saturday at Fredonia. This all leads into the following weekend's section 6 team championships at Houghton.